Since its Sunday, I think everyone has laundry to do. I've been pretty good about doing a load every day during the week. It certainly helps, but I always have the hardest time with that last load (and letting it sit on the couch for a day...or two). We are rolling out a new progress report website (since our school year begins in July, it is already toward the end of our first quarter). Tomorrow, I need to make sure it works for each of our teachers, and if when it doesn't, I need to figure out why. There's already a couple of people who told me it isn't working, so I am hoping I just need to do some simple updates on their computers! My family is taking a much needed long weekend to the mountains! We didn't get a proper vacation this summer, so Thursday-Sunday, we will be re-connecting with nature and each other. I'm so excited! 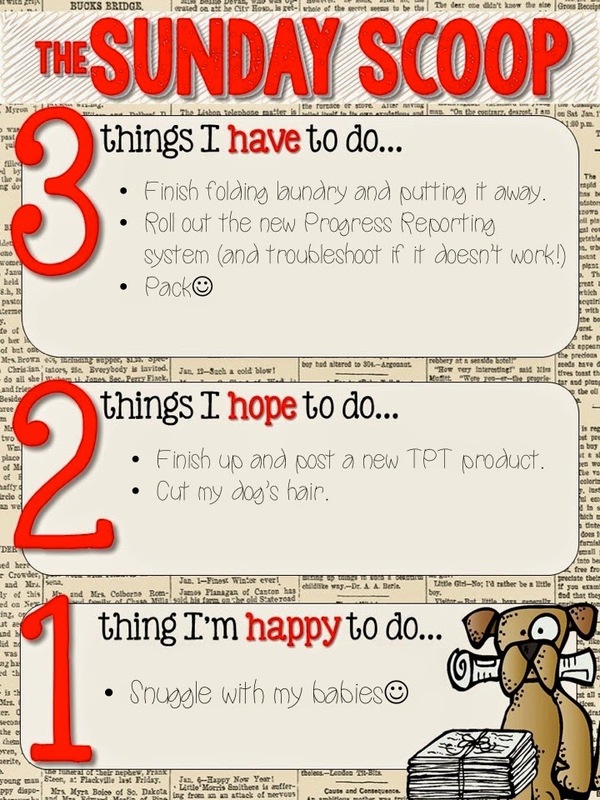 I have most of a new TPT product finished, I just need to get it posted. Hopefully, I can make that happen this week. My poor dog needs a haircut. I really hope to cut it before we leave for our trip. My favorite time of the day is at night, when I'm snuggling with my kids. I always read stories to my son (and sometimes my daughter, but sometimes she falls asleep too early) before bed. I look forward to this simple, quiet time everyday. Kid snuggles are the best! I think the moments right before bed and the moments right after they wake up are the sweetest of the day. Enjoy your kiddos and have a great week! Neither of my kids like to get up in the morning (not even my 9 month old! ), so I much prefer the sweetness of the evening snuggles! Laundry is on my list too :( Enjoy your vacation! I am definitely with you on the snuggling with babies part! My little man is 6 months and just started crawling - ah! Happy for him but want him to stay little too! I also have laundry on my list... and it didn't get all done yesterday!